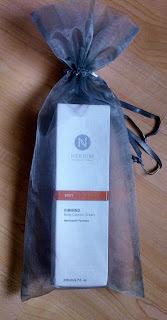 Nerium International Firming Body Contour Cream is definitely a product that is outside of my typical beauty budget. But it's also one of those products I just had to try to see if it worked. There are so many creams out there that claim to get rid of cellulite or tighten skin. Many don't really work. So, I figured maybe a higher-end product was the way to go. Before we get into the specifics of the product, let me tell a little about me and my relationship with cellulite. I've had cellulite since I was a young teen. That's right. At 15 years old, 5'7 and 120 pounds, I had cellulite all over the back of my thighs. Obviously, I was not overweight and it wasn't "due to age," it's just something that has been apart of my body for a long time. And because of this, I never really associated cellulite as anything terrible. It's just something that is: Something that is naturally apart of my body (as well as a lot of other women's bodies). But that doesn't mean that I'm against trying to lessen the appearance of it. So, when I saw Nerium's Firming Body Contour Cream, I was more than a little curious to see if it would make any difference. First, the texture of the product is creamy, smooth, and soaks into the skin quickly. It doesn't feel greasy, slimy, or silicone-y at all. The scent is a little sweet but nothing super noticeable. It definitely wouldn't interfere with any perfume or body wash. The two main active ingredients in the cream are Forskohlii root oil and Caffeine. Not some crazy manufactured chemicals. Lastly, does it work?! I used this product on my upper thighs for a few weeks and I did notice my skin looked tighter. I still had some cellulite when sitting, but the over all look of my thighs was smoother. We all know when it comes to cellulite there is no miracle cream that is going to make it all disappear, but this body cream did make a noticeable difference! It's one of the few skin tightening/cellulite products I've used that actually gave me a visible result. Find more information on Nerium International Firming Body Contour Cream here.